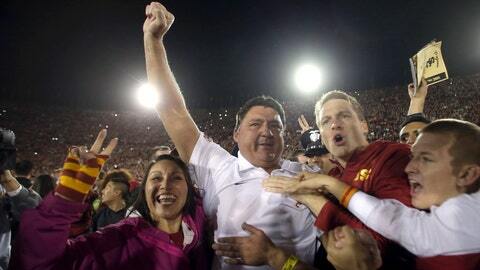 Ed Orgeron became a folk hero at USC during the 2013 season. LOS ANGELES — Clay Helton is not Ed Orgeron. He lacks the Cajun drawl, is short a few pounds, and overall less exuberant than the now former USC assistant and recruiting coordinator. That’s not to say he’s not fiery. He can mix it up on the practice field if need be. The point about him not being Orgeron was expressed when he met with the team for the first time after taking over as USC’s interim. "He told us he’s not Coach O and he’s not going to pretend to be Coach O," safety Josh Shaw said. "He’s going to be himself." Still, there hasn’t been much that’s changed. Helton and the rest of the USC assistants have stuck to the blueprint left behind by Orgeron which included a Roscoe’s Chicken and Waffles team meal earlier this week. Before the Trojans take the field for the Las Vegas Bowl on Saturday, there will be music being blasted in the USC locker room — something that became a staple under Orgeron. "All that will be the same," Shaw said. "The only thing that’ll be different is Coach O won’t be talking. It’ll be Coach Helton now." Everyone in the locker room really wants to win for Coach O. Players say Helton has told the team he will be coaching for Orgeron. When the players take the field there won’t be any doubt who they’ll be playing for or who will be their motivating factor. "Coach O," defensive lineman George Uko said. "(We have to) just get this one done because we know that’s what he would want — just hold up the standards, hold up to the accountability he held us to and just go out there and just have fun and play with fire. Added Shaw: "Everyone in the locker room really wants to win for Coach O." The emotional charge Orgeron provided during his tenure is one that isn’t easy to duplicate. Where the team finds that spark is one of the biggest question marks heading into Saturday’s bowl game. The onus lies on the players. "We have to (provide the energy)," Shaw said. "At the end of the day players play and coaches coach. Our team plays a lot better when we have a lot of energy and energy on the sideline — even the guys that aren’t playing."